Make sure you have completed all the exercises on the first of these two pages before tackling this page. Here are the other three patterns promised. Here's the instructions table, then the three-part video. The same instruction table and the video. Always finish off by playing the melody/pattern from the skeleton sketch. If you can play the tunes from the instruction tables, you are building a good musical skill. 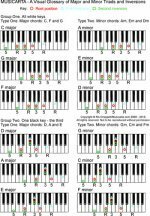 See if you can dream up some more eight-bar (7 + 1) symmetrical pentatonic tunes, and picture them playing in your head, or play them at the keyboard in a variety of keys. When you're trying to play a melody by ear, you need to know if the note stays the same pitch, or goes up, or down. Use the skills you've learned in these modules in your own musical missions!